It’s interesting to me that Lululemon has chosen to reference an anti Occupy Wall Street campaign in their latest shoppers using the literary reference of John Galt from Atlas Shrugged. Occupy Wall Street has roots here in Vancouver where the idea was started by Ad Busters, an anti consumerist group (read here). It’s funny to me because Lululemon the corporation is trying to set themselves apart as being the 1%. 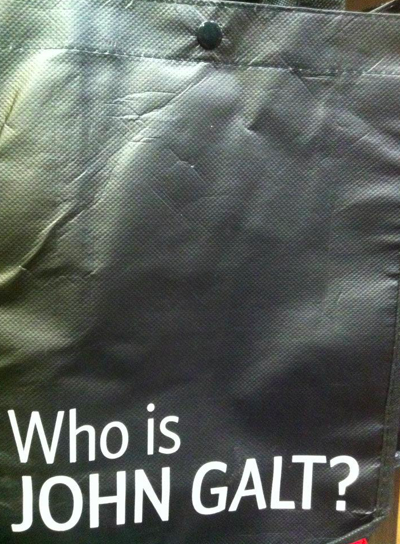 Lululemon is asking US who John Galt is! Or, maybe they are telling us they are ‘going Galt’ against us the consumers by cutting back? I’m not sure, something to think about but at first blush it doesn’t sit right and makes me very uncomfortable with what they are saying. Do I think the economic malaise that people are feeling right now is big bad corporations fault? Nope, not entirely. But I don’t like a corporation which is seeing obscene profits using this reference as an ad campaign. Not unless they have chosen to shut down factories overseas and bring the work home to North America. What do you readers make of this? Will you as consumers proudly carry around this shopper at Christmas time? 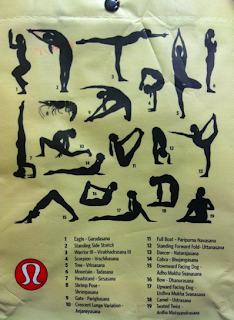 Are we elevating lululemon from mediocrity into ivory towers with our money? 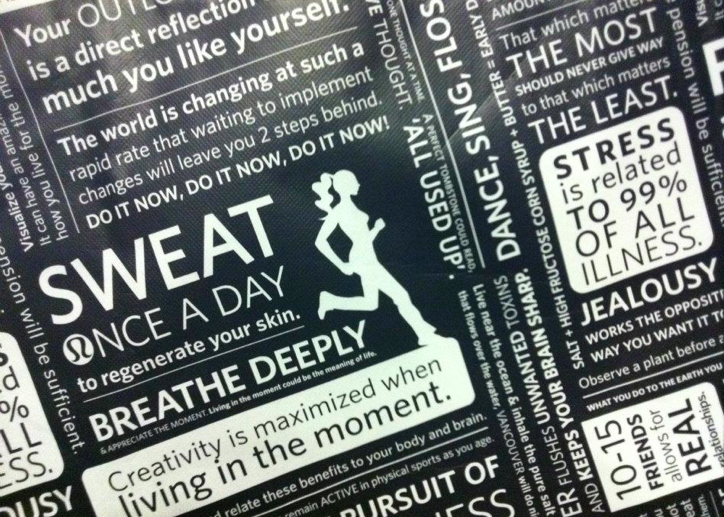 **the message is capitalism rules and that socialism oppresses the innovation lululemon constantly strives for. Full disclosure, I have not read Atlas Shrugged, nor am I interested in reading it, but I am exploring the confrontational statement of ‘Who is John Galt’ and why lululemon is asking us this and why they are using this in their ad. I maintain my cynical view of a big corporation making obscene profits using this reference on shopping bags that consumers will carry around at Christmas as being arrogant, particularly in this depressed economic climate. Lululemon has made a blog post called Who Is Jon Galt? to explain their use of this ad as merely ‘motivational’ and they would like us to believe that the message is simply strive to be the best, however many of the comments on this post also question why Lulumon would use such an offensive and radical ideology in their shoppers during a depressed economy. Did they knowingly post something so offensive or did they just not realize the deeper message of the book that customers are getting from the shoppers? "Fit Report: Don’t Hurry Be Happy Pullover"
Nope, I will not carry this bag. When I go to lulu I will bring my own. I agree with you lulumum entirely in what you said about bringing production back to the US and such a company who makes such an INSANE profit chastising like this. Thanks for bringing this up. Seriously–lulu educators read Atlas Shrugged. No way. We live in the society of John Galt, it's failing! Does this justify their price increases? Should they be praised? Doesn't this go against the lulu manifesto? Are friends more important than money, or are millionaires better than average people? Should the manifesto been changed? Yup we do as well as 12 other books, also most of us have collage degree's and are in grad school or in post grad programs, surprising right (thats sarcasm). The company we work for is made up of leaders if you haven't noticed its a bit more then a regular retail environment. Thank you anonymous for speaking up about how ridiculous this is as a whole. And come on these bags where being designed close to a year ago all companies start making there plans for holiday right after the previous holiday ends. Anon 7:03 How's that "collage" degree working out for you? Sorry – couldn't resist. As for the bags, I must be thick but I don't get what they are trying to say. Not the first time lulu's attempts at being provocative have been lost on me…..
Gosh, what is the point of putting kids through college when basic skills like grammar and spelling are being thrown out the window? There is a difference between "then" and "than", it's spelt 'that's', and please, please use punctuation. (As in periods and commas). Today I was at a store where an educator referred to tree frog as lime green, was told the dance studio pants were thermal-insulated, and the gratitude wraps were totally a new product (after I had inquired about the differences between the old ones and the new). BRUTAL! How do they expect to sell items at higher price points when the people selling the items sound horribly un-educated. It is somewhat annoying walking in and looking at new items, and an educator walks up and says something about a product that is totally wrong. I was also told today that the free to be bra was one of the most supportive bras. Just crazy. Oh, and the new Ariel tank? The pink color is "rosey pink" 😉 Hahahaha!!! Shoppers are shoppers. They help haul my groceries from the store, to my car and to my house without polluting the environment. 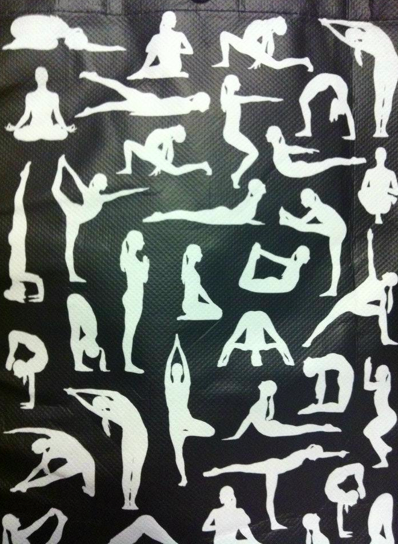 Thank you Lululemon for giving them out with each of my purchases. I couldn't care less what the shoppers designs are, they help me so I don't have boxes full of plastic bags flying around my house. 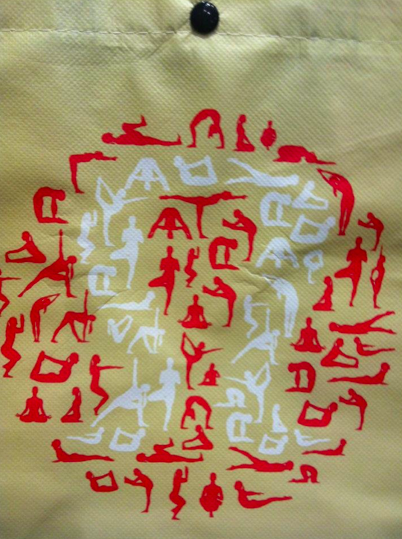 Of course lululemon would put out a bag like this! Just like they have naked campaigns and Kesler ads. It's just lulu trying to controversial and relevent. Nothing new. Hey psychopaths. The John Galt reference is moreso to make a point that is pretty blatant in Atlas Shrugged regarding the suppression of innovation. 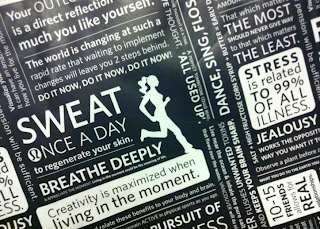 lululemon culture is all about being innovative and constantly evolving. They always want the latest and greatest thing that will impress and serve their customers' needs. John Galt is an obvious symbol for the power of innovation in stark contrast to the oppressive government around him which thrives off mediocrity. Please find a new hobby. Maybe read a book. This is not an "arrogant ad campaign" and I find it laughable that you have spun this into such a sensational, outlandish post…perhaps just to create buzz on your blog. It is sad how very cynical and jaded you are about a consumer culture you clearly buy into. Hyprcritical, much? Hypocritical* Please excuse my typo before you bite my head off. I plead "human". Well maybe the their timing is off on releasing these bags (frankly I think not) but perhaps considering the political climate these days they should reconsider such an inflammatory campaign during the upcoming shopping season. It may not mean much to you or I personally but there are plenty of people who this does resonate with. "Do they feel upset that we are reselling the items we buy when we no longer want them for whatever reason? Places where we can resell our Lululemon items such as The Lululemon Exchange, Ebay, The Lululemon Trading Post, Craigslist etc allow us to offload items we are no longer using so that we can buy more items. The high resale value of lululemon clothing is the reason I can make the purchases I make and the reason I feel good about buying Lululemon clothing. It's part of the appeal. This is the same for companies such as Gymboree, Starbucks (mugs), Anthropologie, JCrew and many more. There is a market for these items on the resale market which is why we pay the prices we do for them." Anon 7:03, I mean no disrespect to you but having a higher education doesn't prevent you from being naive. I do realize that the book has been part of lululemon culture from the beginning. In fact, I read a few articles about that while I was researching for this post. It is a not at all surprising message that Chip is trying to convey to educators. Its the message that capitalism rules, socialism does not fit in with this company (no union please, hello, that would be detrimental to the 1%). This is a consistent lululemon message and should be part of there manifesto because it's the only one that rings true. This is part of an ad campaign and the timing is not incidental. This would not have been placed on there seasonal shopping bags unless there was a context for it. Ask yourself why this out now. It is meant, as all lululemon ads (I know they claim not to advertise but this is in fact Gorilla marketing) to be confrontational and shocking and to piss people off. Finally, I think I need to explain that I am not an 'occupy wallstreet' protester. I am not a socialist and I see the value of capitalism. However, I think the 1% needs to keep to there ivory towers and not make an arrogant ad campaign like this and not expect at least some of there consumers to actually read what they write and think about it for more than 2 seconds. I agree, without the negative name-calling, or character reference, with Anon 12:23. 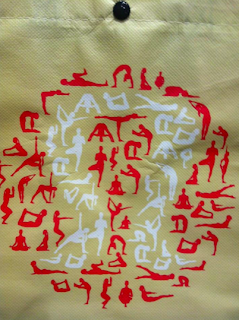 People complain about how hypocritical Lululemon is, the poor customer service, the ad campaigns…yet, everyone still turns around and buys the merchandise. I can't even comment on the post/political statement at this point because I'm a bit disturbed by the comments clearly made by people affiliated with Lululemon. Haven't you heard the expression "don't bite the hand that feeds you?" Honest, unbiased opinions are what you get on this blog. People need to recognize like any relationship, there are ups and downs. Having a disagreement with your spouse that doesn't end in divorce isn't hypocrisy. This is an extreme example, yes, but it does illustrate how ludicrous that kind of statement is. This type of information and manner in which it is presented is directly responsible for sales of the brand. So be careful about making such disrespectful, inflammatory statements. john galt reference is meant to make you think – mission accomplished – now maybe you'll read the book so you know what you are talking about? LOL, it's a scorpion. I enlarged the pic. But I think Shrimpasana sounds hilarious! I don't think its a scorpion! Totally agree, Dawn. Anon 12:23: I think you can make your point and participate in this discussion without resorting to name calling. Don't take my opinions about the company so personally. Anon 8:37, thank you for disagreeing respectfully. Is it hypocritical of me to make purchases and still complain about the poor customer service (customer service in regards to corporate policies) or for complaining about quality control issues? yes slightly I guess. I guess I can't complain as a consumer unless I stop making purchases at lululemon. I guess the reason I still do is because instead of being cynical I am hopeful that voicing concerns could lead to innovation and improvement. I figure feedback is useful, 'we love feedback', no? My goal is not to disparage the company, I like the clothes for the most part. 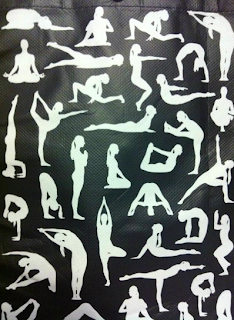 I'm endlessly fascinated by the culture at lululemon. Most of the time I am inspired, not offended. But I am not a sycophant about the clothes or the company. This blog provides an objective opinion. I am in no way monetized or supported by lululemon therefore my opinions are from the perspective of the consumer who uses hard earned money to make the purchases I make. I talk about the clothes that I like, the clothes that disappoint. Quality issues, customer service, discussions about ad campaigns etc. This post was made because it is relevant and the ad is confrontational and I took the bait and am actually thinking about what lululemon is telling us the consumers. I hope you are not taking any of this personally, Lulumum. I love your blog and I know how much work it must be. Once something is out in the Universe it is free to be acted upon by whatever the viewer brings to it. Even if it differs from the creator's intent, that doesn't make someone else's perception wrong. Your interpretation about what that bag is saying is just as valid as any Anonymous on this blog. It doesn't matter if they were designed and produced months ago or not. They're being released now, they are being placed into context of what is happening now. Having previously worked at a larger store, I can say with confidence that the vast majority of educators have not read this book, nor many of the other books, either. Moreover, while many of the educators are educated — in the traditional, university sense — this does not imply that most can also speak to nuanced political, business, and literary narratives that John Galt alludes to. Although I may get grilled for overgeneralizing, I would be shocked if any significant portion of the company could speak to Atlas Shrugged without substantial priming. If any of you want to experiment, and seeing as most on the blog are frequenters of the stores, simply ask around about the bags and see how cognizant and unrehearsed the responses you receive are. As for anyone claiming any portion of Atlas Shrugged is apolitical, you are simply not paying attention. The book is often regarded as one of the essential political novels of the last century, and is presently being used by a number of political organizations, including the Tea Party. Further, no one can expect to put a message out into the world, as advertising does, and expect that you can then dictate how others are going to receive it. To claim that lululemon "meant" it in one capacity so others mustn't analyze it in another is nothing but snotty, advertising bigotry. Lastly, participating in a consumer culture does not implicitly make a person hypocritical for critiquing aspects said culture. People resist in many ways and at many junctures; for some, perhaps, this bag is a step too far. It is not, therefore, hypocritical to want functional and fashionable clothes but also believe that socio-economic disparity should be significantly lessened (something Atlas Shrug cares little about). While l could go on at length about this, anybody who claims otherwise is simply unaware of a discourse that has been present decades before this bag was released.